To Cite: Kashfi M, Hashemi A, Eslami G, Sadredin Amin M, Tarashi S, et al. 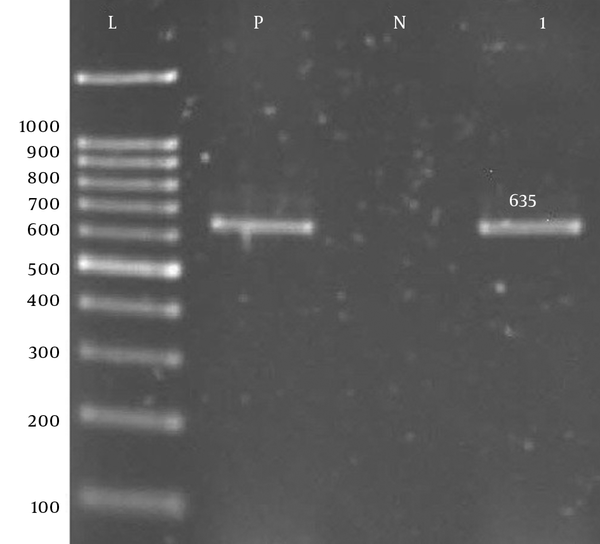 The Prevalence of Aminoglycoside-Modifying Enzyme Genes Among Pseudomonas aeruginosa Strains Isolated From Burn Patients, Arch Clin Infect Dis. 2017 ; 12(1):e40896. doi: 10.5812/archcid.40896. Background: The prevalence of resistance to aminoglycosides among P. aeruginosa isolates has increased all around the world. The resistance is caused through different mechanisms. One of these mechanisms is the use of enzymes such as phosphoryltransferases, acetyltransferases, and nucleotidyltransferases. Objectives: The present study was conducted to determine the prevalence of Aph (3′)-Ib, Aph(6′)-VI, rmtA, aac (6′)-IIa, aadA, aadB, and armA genes among P. aeruginosa strains isolated from burn patients located in Tehran, Iran. Methods: This descriptive study was performed on patients hospitalized at the Shahid Motahari burn hospital during August 2014 to July 2015. Antibiotic susceptibility tests were performed by disc diffusion and minimum inhibitory concentration methods. Aph (3′)-Ib, Aph (6′)-VI, rmtA, aac (6′)-IIa, aadA, aadB, and armA genes were detected by PCR. Results: 60 isolates were evaluated for antimicrobial susceptibility testing. The resistance of P. aeruginosa isolates to the tested antibiotics was as follows: 56 (94%) to ciprofloxacin, 57 (95%) to gentamicin, 57 (95%) to Imipenem, 57 (95%) to meropenem, 56 (94%) to doripenem, 49 (82%) to piperacillin-tazobactam, 58 (97.2%) to amikacin, 45 (75%) to ceftazidime, 59(98%) to Ticarcillin, 56 (93%) to Cefepime, 54 (90%) to piperacillin, 54 (90%) to Aztreonam, and 0 (0%) to colistin. Minimum inhibitory concentration (MIC) for amikacin and Gentamicin was determined according to the guidelines of CLSI. The highest resistance rate according to the MIC method was observed for Gentamicin and amikacin in 128 (40%) and 256 (92%) of the isolates, respectively. In this study, 94% of the isolates were multiple drug resistance (MDR). The prevalence of Aph (3′)-Ib, Aph (6′)-VI, rmtA, aac (6′)-IIa, aadA, aadB, and armA genes were 60%, 85%, 45%, 10%, 87.5%, and 55% according to the PCR, method respectively. Conclusions: This study detected multiple drug resistance (MDR) in P. aeruginosa including aminoglycosides. Therefore, identification of drug resistance patterns in P. aeruginosa is of great importance in prevention and control of infections in burn patient centers. Burn patients who have been hospitalized are at risk of being infected with multi drug resistant (MDR) bacteria including P. aeruginosa. These bacterium are amongst the important causes of Gram-negative infections, especially in burn patients. P. aeruginosa is the causative agent for a number of infections such as urinary tract infection (UTI), septicemia, endocarditis, pneumonia, skin, ears and eye infections and a leading cause of mortality amongst burn patients (1). P. aeruginosa is intrinsically resistant to a variety of antimicrobials (2, 3). The resistance of bacteria to antibiotics such as beta-lactams and aminoglycosides is increasing (4). Although the resistance typically results from drug inactivation by enzymes, enzyme-independent resistance is also common (5). The resistance enzymes are encoded by plasmids or chromosomes and may transfer to other species. Phosphorylation by aminoglycoside phosphoryltransferases (APHs), acetylation by aminoglycoside acetyltransferases (AACs), and adenylation by aminoglycoside nucleotidyltransferases (ANTs) or aminoglycoside adenylyltransferase (AAD) are mechanisms for enzymatic modification of aminoglycosides that lead to antibiotic inactivation (5, 6). The most important acetylation enzyme is aac(6′)-IIa. This enzyme is the main cause of resistance to tobramycin, gentamicin, and Amikacin. aph(3′)-Ib is a phosphoryltransferase enzyme that causes resistance to kanamycin, neomycin, and streptomycin (7). ANT(2′)-I enzyme is the most prevalent nucleotidyltransferase amongst P. aeruginosa isolates, which inactivates Gentamicin and Tobramycin but not amikacin (6). aadA and aadB genes encode ANT(3) and ANT(2) -I enzymes, respectively (6). Another mechanism for antibiotic inactivation is methylation of the 16S rRNA of the A site of the 30S ribosomal subunit. This mechanism interferes with aminoglycoside binding and consequently leads to resistance to clinically relevant aminoglycosides like amikacin, gentamicin, and tobramycin (8). The aminoglycoside-modifying enzyme genes including rmtA and armA involve high-level aminoglycoside resistance with promoting 16S rRNA methylases in P. aeruginosa (9, 10). The aim of this study was detection of Aph(3′)-Ib, Aph(6′)-VI, rmtA, aac(6′)-IIa, aadA, aadB, and armA genes among P. aeruginosa strains isolated from burn patients hospitalized at Shahid Motahari hospital, Tehran, Iran during August 2014 to July 2015. This descriptive study was conducted on P. aeruginosa isolates collected during August 2014 to July 2015 from burn patients hospitalized at Shahid Motahari Hospital. Samples were collected by sterile swabs. Stuart media was used as transfer medium. Samples were cultured on MacConkey agar (Merck, Germany) and Cetrimide agar (Merck, Germany) and incubated at 37°C for 24 hours. Isolates of P. aeruginosa were detected by conventional laboratory tests such as oxidase test, catalase test, sugar fermentation test, and ability of growth in 42°C. P. aeruginosa ATCC27853 was used as a control strain (11). Antimicrobial susceptibility to Imipenem (IPM, 10 μg), Meropenem (MEM, 10 μg), ceftazidime (CAZ, 30 μg), amikacin (AK, 30 μg), piperacillin/tazobactam (PTZ, 100/10 μg), ciprofloxacin (CIP, 5 μg), cefepime (FEP, 30 μg), aztreonam (ATM, 30 μg), gentamicin (GEN, 10 μg), doripenem (DOR, 10 μg), ticarcillin (TC, 30 μg), piperacillin (PRL, 100 μg), and colistin (CO, 10 μg) was performed by the Kirby-Bauer disk diffusion method on Mueller Hinton agar (Merck, Germany) based on the clinical and laboratory standards institute (CLSI) guidelines (12). P. aeruginosa ATCC27853 was used as a control strain. Minimum inhibitory concentration test was performed by microdilution broth method for two aminoglycosides (Amikacin and Gentamicin) according to the Clinical and Laboratory Standards Institute (CLSI) guidelines (11). P. aeruginosa ATCC27853 was used as a control strain. Bacterium were cultured in LB (Luria Bertani) and were incubated overnight at 37°C. 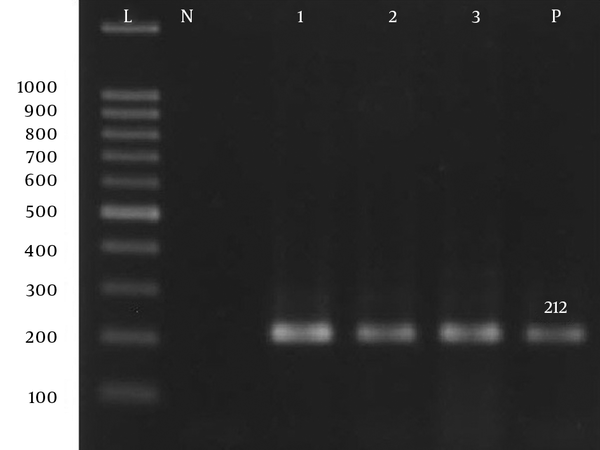 Bacterial DNA was extracted by the standard DNA Extraction Kit (GeNet Bio, Korea, Cat. No K-3000). Polymerase chain reaction (PCR) amplification was performed for detection of Aph(3′)-Ib, Aph(6′)-VI, rmtA, aac(6ˊ)-IIa, aadA, aadB, and armA genes. The sequences of primer pairs used in the study are shown in Table 1. 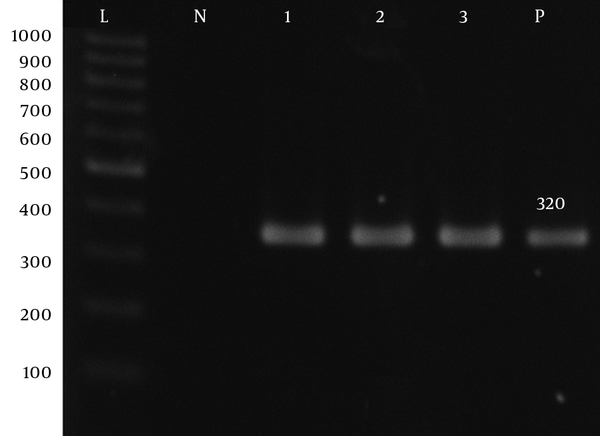 Three µL of the extracted DNA (100 ng/µL) was added to a final volume of 25 µL PCR mixture containing 12.5 µL of 2 × Master Mix (Sinaclon- Iran, CAT. NO. : PR901638), including 1 × PCR buffer, 0.08 IU Taq DNA, 3 mmol/L MgCl2 and 0.4 mmol/L dNTP polymerase, 1 µL of 10 pmol/L from each primer, and 7.5 µL of sterile distilled water. PCR conditions included 36 cycles of amplification under the following conditions: Initiation Denaturation, 10 minutes at 94°C, Denaturation at 94°C for 30 seconds, annealing for 1 minute at primer set specific temperatures (Table 1), and extension at 72°C for 1 minute. Cycling was followed by a final extension at 72°C for 10 minutes. MINITAB16 software was used for statistical analysis. The P value and confidence of intervals were < 0.05 and 95%, respectively. Sixty P. aeruginosa isolates were collected (47 (78%) from males and 13 (22%) from females). The mean age was 36 ± 1. The resistance of P. aeruginosa isolates against tested antibiotics was as follows: 56 (94%) to ciprofloxacin, 57 (95%) to gentamicin, 57 (95%) to imipenem, 57 (95%) to Meropenem, 56 (94%) to doripenem, 49 (82%) to piperacillin-tazobactam, 105 (97.2%) to amikacin, 45 (75%) to ceftazidime, 59(98%) to ticarcillin, 56 (93%) to cefepime, 54 (90%) to piperacillin, 54 (90%) to aztreonam, and 0 (0%) to colistin (Mast Group, merseyside, UK). Figure 1 shows the percentage of resistances by antibiotics resistance. Abbreviations: CO, colistin; ATM, aztreonam; PRL, piperacillin; TC, ticarcillin; CAZ, ceftazidime; AN, amikacin; PTZ, piperacillin-tazobactam; DOR, doripenem; MEM, meropenem; IMP, imipenem; GM, gentamicin; CIP, ciprofloxacin. Highest amount of resistance in MIC for gentamicin was 256 (38%). While highest amount of resistance in MIC for Amikacin was 32 (70%) (Table 2). 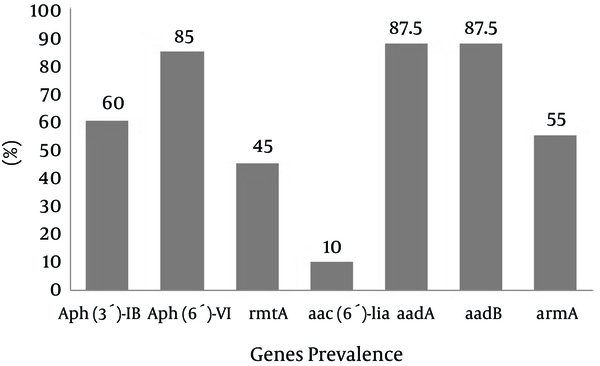 Prevalence of Aph(3′)-Ib, Aph(6′)-VI, rmtA, aac(6′)-IIa, aadA, aadB, and armA genes was 60%, 85%, 45%, 10%, 87.5%, and 55%, respectively (Figure 1 - 7). 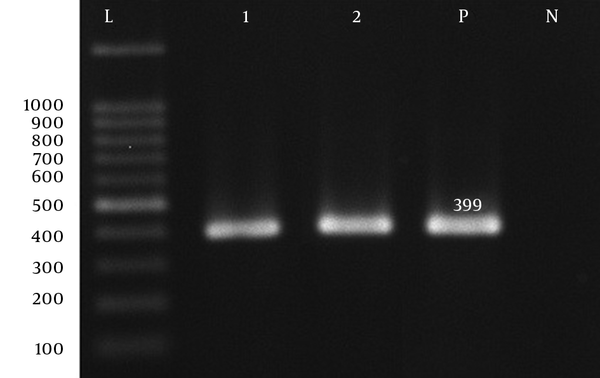 L, 100 bp DNA size marker; P, positive control; N, negative control, 1 and 2 clinical positive isolates. 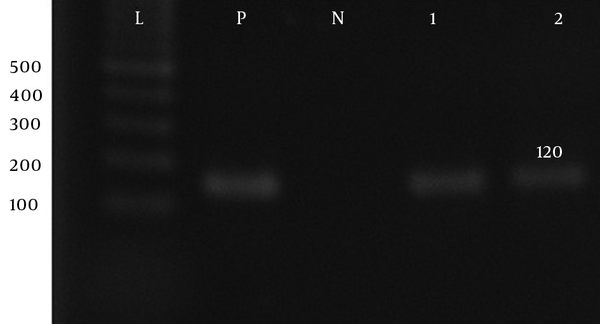 L, 100 bp DNA size marker; P, positive control; N, negative control, 1, 2 and 3 clinical positive isolates. L, 100 bp DNA size marker; P, positive control; N, negative control, 1 clinical positive isolate. Antibiotic therapies are widely used for treating infectious diseases (16). Previous studies have indicated that P. aeruginosa is the most common bacterial isolate in burn wards in Tehran, Iran (17, 18). P. aeruginosa is resistant to a range of antibiotics such as Beta-lactams and aminoglycosides (19). Aminoglycoside resistance in P. aeruginosa is often associated with the production of various enzymes (5, 6). This resistance has become a worldwide problem (20), especially in Asia (21). According to disk diffusion results 94% of the isolates were resistant to ciprofloxacin and 75% were resistance to ceftazidime. Also 66.6% of the isolates were detected as multi-drug resistant (MDR), which shows that the resistance rate has increased in comparison with other studies. Results of a study done in Yazd, Iran during 2013 showed the most resistance rate was seen for ceftazidime, in that 56% of the isolates were resistant to this antibiotic. In the same study the resistance rate to Ciprofloxacin was 44.4% and 94% of the isolates were detected as multi-drug resistant (MDR) (18). In a study done in Tehran, Iran, the resistance rate was 43% for Gentamicin and 24% for amikacin (22), which is lower in comparison with our study. These reports are in contrary with the result of our study, in which Gentamicin and Amikacin resistances rates among P. aeruginosa isolates from wound infections were 95% and 91%, respectively. Limitations in phenotypic methods make researchers confirm phenotypic results by molecular methods. In the present study, the aadA, aadB and Aph(6′)-VI genes were more prevalent than the armA, Aph(3′)-Ib and aac(6′)-IIa genes amongst P. aeruginosa isolates of burn patients. This prevalence of genes in our study showed an increasing trend of resistance in comparison to previous years. In a study from France, 1.9% of isolates were positive for the aac(6′)-IIa gene in 2008 (15) while in our study, 10% of the isolates were positive for the aac(6′)-IIa gene. PCR results for aminoglycoside resistance methyltransferase (21) gene was negative in Tehran during 2011 (23). In a study from China, armA was detected in 22% of P. aeruginosa strains (24). While in the present study, armA was detected in 55% of isolates. Prevalence of Aph(3′)-Ib, Aph(6-VI), aadA, and aadB genes were 60%, 85%, 87.5%, and 87.5%, respectively. In other countries, the prevalence of the genes were different. In a study from Poland, the prevalence of Aph(3′)-Ib gene was 8.0% (20). In another study from Nigeria, aac(6′)-IIa and ant (2′′)-I were found in 12 isolates out of 54 (18.5%). Also in our study, none of the isolates were positive for the Aph(3′)-Ib and aac(6′)-IIa genes (25). Therefore, control and treatment of these infections caused by P. aeruginosa is complex, there is a need for revise treatment protocols to prevent resistant genes dissemination amongst clinical isolates. This work was financially supported by the Shahid Beheshti University of Medical Sciences, Tehran, Iran.